Here’s an overview of the available flights to Nairobi from many places in the world. Nairobi is the hub of East Africa, and has the 4th biggest airport of the African continent. Dozens of international airlines fly to Nairobi. 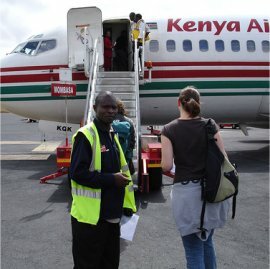 For researching cheap flights to Kenya, I especially use Kayak.com and Vayama.com. Both automatically search the lowest fares from hundreds of travel networks and sites, within seconds. It saves me hours of research each time. Kayak collects data from 140+ travel sites while Vayama targets airline sites and is especially useful for travelers to and from the USA and Western Europe. I found both offer more flights to Kenya to choose from than other booking engines. All flights from the USA and Canada go via one of the European hubs: mainly Amsterdam, London, Brussels or Zurich. This also means it's sometimes cheaper to book seperate flights: one ticket to Europe, and from there a ticket to Kenya. From the USA, Northwest Airlines is affiliated to Kenya Airways and KLM and it offers good connections to Kenya via London or Amsterdam. Other possibilities are British Airways or Virgin Atlantic (sometimes combined with Kenya Airways). Return ticket from the US east coast are available starting from US$1100-$1300 in the low season, and from the west coast from US$1250-$1500 and up. Flights from Canada are roughly 10% more expensive. It’s also possible to get a connecting flight in the Middle East. European airlines with flights to Kenya include KLM (from Amsterdam), Swiss International Airlines (from Zurich) and Brussel Airlines (from Brussels). Return rates start, depending on the season, from 600 to 800 Euro. There are no direct flights from Australia or New Zealand to Kenya. You’ll have to change planes in southern Africa, the Middle East, the Indian Ocean or Asia. Flying via Europe is possible, but it takes much longer and is usually more expensive. The most direct option is flying via Mauritius with Air Mauritius. But flying via Johannesburg with South African Airlines or via the Persian Gulf with Emirates is usually cheaper. Return fares start from A$ 2250 from Sydney, Melbourne or Perth and A$ 2750 from Auckland. Kenya Airways flies to Hong Kong, Guangzhou (China), Bangkok (Thailand), Dubai (UAE), Mumbai (India) a few times a week. Nairobi is one of the major hubs in Africa, and Kenya Airways and other companies maintain connections with some 30 major cities in Africa. Especially the air connections between East and West Africa are good, with north Africa almost absent and South-Africa limited to Johannesburg. 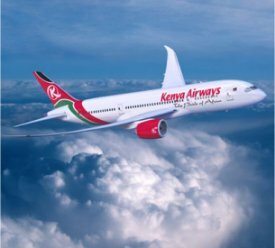 Among the Kenyan air companies offering (usually, daily) flights between Mombasa and Nairobi, are Kenya Airways, Air Kenya, Safarilink, Jetlink Express and Mombasa Air Safaris. Of these, Kenya Airways is the most reliable and offers usually the best quality. Furthermore, it’s possible to fly from Nairobi (and often Mombasa) to the most popular wildlife resorts and other tourist hotspots in Kenya, with the companies mentioned or with a chartered flight through your tour operator. Destinations include Lamu, Malindi, Eldoret, Masai Mara National Reserve, Mount Kilimanjaro (in Tanzania), Amboseli National Park and Samburu National Park. Most international flights come in through Jomo Kenyatta International Airport. It's the 4th largest airport in all of Africa and handles international as well as domestic flights. By African standards, it’s a well-equipped airport. It has two international terminals, one terminal for domestic flights, a huge number of tax-free shops and of course cafetarias and bars. Taxis are plenty. The other Nairobi airport is Wilson Airport. It's used only for flights within Kenya and to neighbouring countries like Tanzania. Here's a list of all Kenya airports. Kenya’s international airline is Kenya Airways. It has an excellent reputation for quality, and a good safety record.